Bookeo is proud to announce our new release full of useful features to simplify your life. You and your customers are going to love the new site-embedded mobile booking widget, mobile color and design capabilities, more user-friendly participant number selection and many more new features. Take a look. If you have embedded the booking widget on your website, you can now fully integrate it into your mobile website too. Your mobile-using customers can now book and pay without leaving your mobile website. Yep. Your mobile customers get a more seamless booking experience, and you get happier customers! Show your main booking page (the first page of the booking process) embedded in your website, then redirect customers to the enlarged full-screen Bookeo booking widget in a new browser tab. Or, stick with the current mobile-user booking widget process which enlarges the widget to full screen. These options give you maximum flexibility to set your mobile customers’ booking process. Click here to learn more. Want to set the color and style of your mobile device widget to match the color and style of your website? No problem. No matter which mobile widget integration option you choose, you can now easily customize the color of your mobile booking widget. Click here to learn how to make those adjustments. 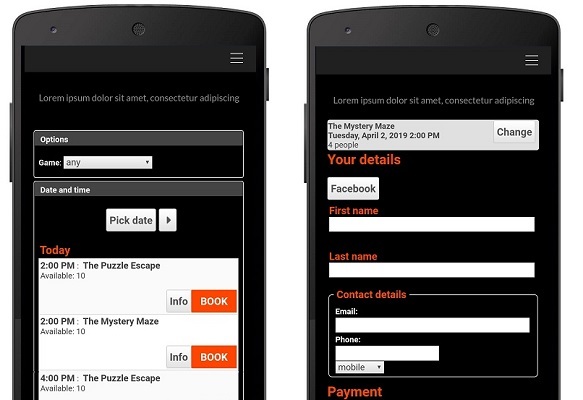 Want to further customize the booking interface for your mobile customers? 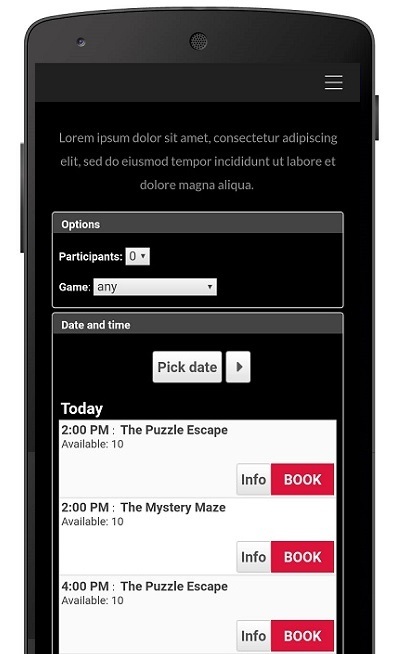 If you have coding knowledge you can now add CSS rules to further personalize the mobile booking interface. Click here to learn how to add these CSS rules. If you use the booking mode to show upcoming classes/tours/games in your booking page, customers can now select the number of participants after they click the BOOK button. When customers click the BOOK button, a pop-up window now opens, allowing them to select the number of participants for the booking. This makes the booking process smoother and more intuitive for your customers. If you wish, you can continue to show the participant number selection at the top of the widget, or you can disable it following the instructions in this tutorial here. You can now turn off waiting list notifications for specific tours or classes. For example, if you want to prioritize a customer who is not currently on the waiting list, you can turn off notifications for that tour or class. You can then add the priority customer without notifications being sent to customers on the waiting list. You can then reenable waiting lists notifications. Click here to learn how to enable this feature. You wanted more gift voucher control, and we delivered. Gift vouchers now come with even more flexible functionality. In just a couple of clicks, you can now change a gift voucher’s expiration date to extend its validity. Click here to learn more. Now you can cancel a gift voucher without having to delete it. This is possible whether or not the voucher has been used. This feature means you retain a record of the voucher, payment, and donor for future reference. Click here to learn more. If needed, you can also restore a canceled voucher with a single click, allowing the customer to redeem it. Click here to learn more. You can now disable the feature which allows your staff to capture credit card details when creating a booking. Once disabled, this option will no longer show to your staff members. A customized, integrated, customer-focused mobile booking widget. The power to prioritize certain customers. More control over vouchers, and smoother customer and staff experiences. What more could a savvy business owner want? We love when you tell us how we can improve. Please keep it up! Your input helps us make Bookeo the perfect booking system for you.